Recent sentiment data is getting a bit extreme toward the bullish side of the equation. This is often a precursor to a correction; in fact, the last time sentiment was this one-sided was Summer of 2011, shortly before the mini-crash. It's interesting to see sentiment reaching these extremes at a time when markets are bumping against long-term trend resistance (many markets have reached the upper boundaries of long-term trend channels, as I've covered in previous updates). In addition, equities are quite overbought on weekly time-frames. But we can't talk about that stuff, can we? These days, even hinting at anything bearish is about as popular as hinting that you're considering becoming a politician (though decidedly less scandalous). While we're seeing some early-warning indications that trouble may be brewing, we must remain cognizant of the fact that the trend is indeed still up. Things such as sentiment are warning signals; signs which suggest caution is warranted. 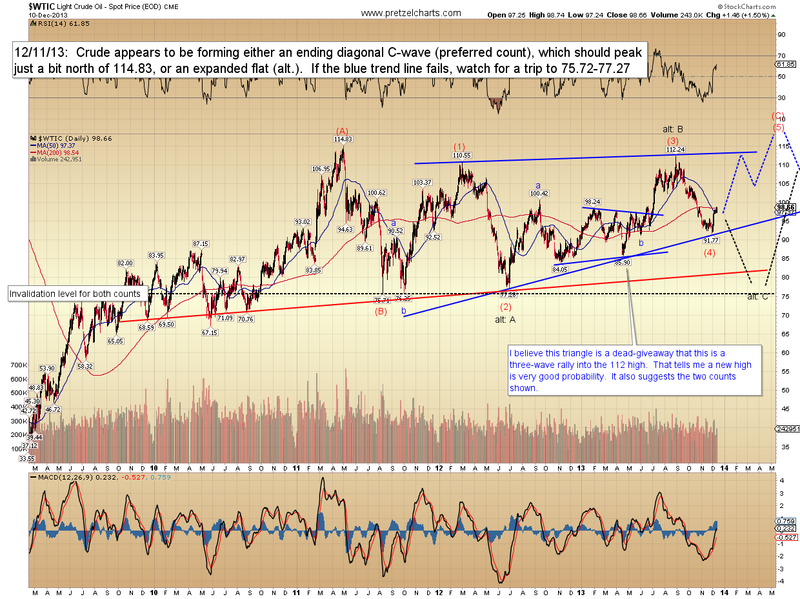 They are not to be confused with guarantees of an immediate reversal of trend. I view these additional warnings as added potential energy which is awaiting a catalyst. In physics, potential energy is stored energy; it's the energy available for a future reaction. I often view stock market chart patterns as similar to a coiling spring -- markets seem to build energy in advance of a move, and I believe that build-up stage is observable. In the current instance, the "coiling spring" is wound pretty tight already. At some point, it will need to release some of that stored tension -- but that doesn't guarantee it can't wind even tighter before doing so. While I continue to feel risk is increasing for long positions, ideally, I'd still like to see a trip into the SPX 1825-1840 target zone before any major "events." The 3-minute chart of the S&P 500 (SPX) notes a bullish buy trigger and a bearish sell trigger, along with the added note that Target 2 (1808-1813) has now been captured. 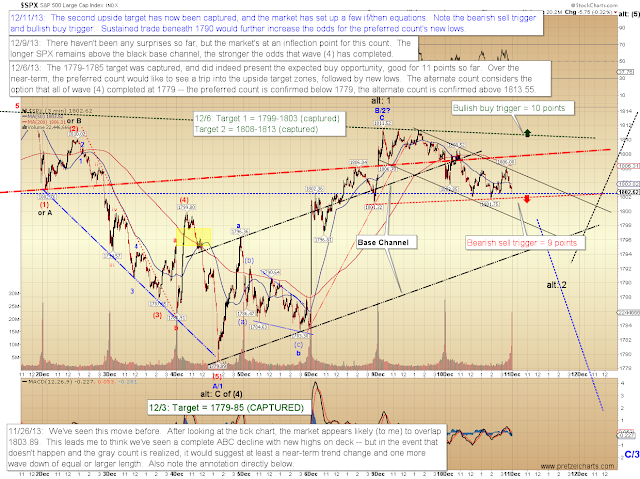 Sustained trade below 1790 would suggest new swing lows. The 3-minute chart above should help with directional tracking for the preferred vs. alternate count on the 30-minute chart below. As I've mentioned in previous updates, if all my work is perfectly aligned across time frames, I'd like to see a new low, followed by a new all-time-high, followed by an intermediate trend reversal. That's asking a lot from my work, though -- it would be unusual if there isn't an adjustment required somewhere along the line, so we'll continue to take it day-by-day as it unfolds. I'd also like to add a quick update on the long-term oil chart. 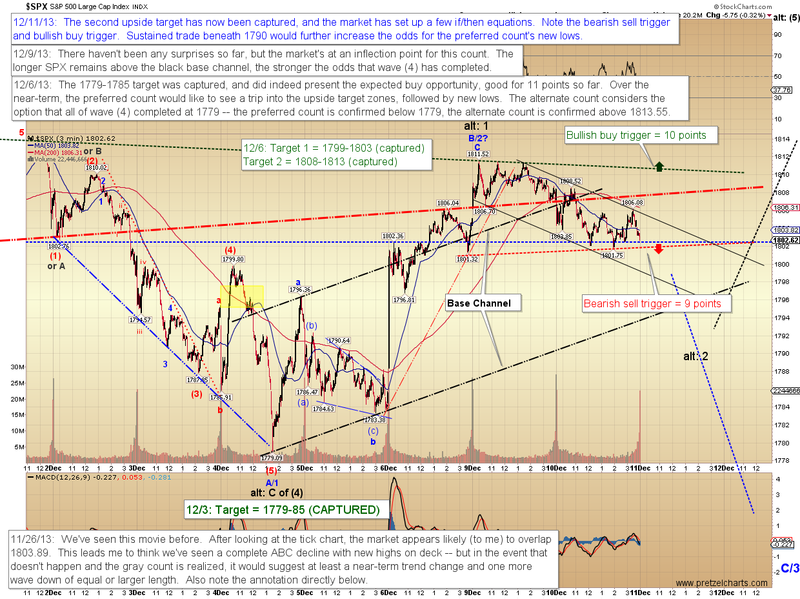 My work here suggests two main possibilities, both of which ultimately lead to new multi-year highs north of 114.83. The preferred count favors that this run is already underway, but the chart notes the signal which would suggest the alternate count was unfolding -- if the blue trend line breaks, we'll look for a trip to retest the bottom of the range. From there, I would then currently still anticipate new highs as long as the noted invalidation level holds. In conclusion, as noted, we have fairly decent signals available to build from as the next few sessions unfold. Trade safe. 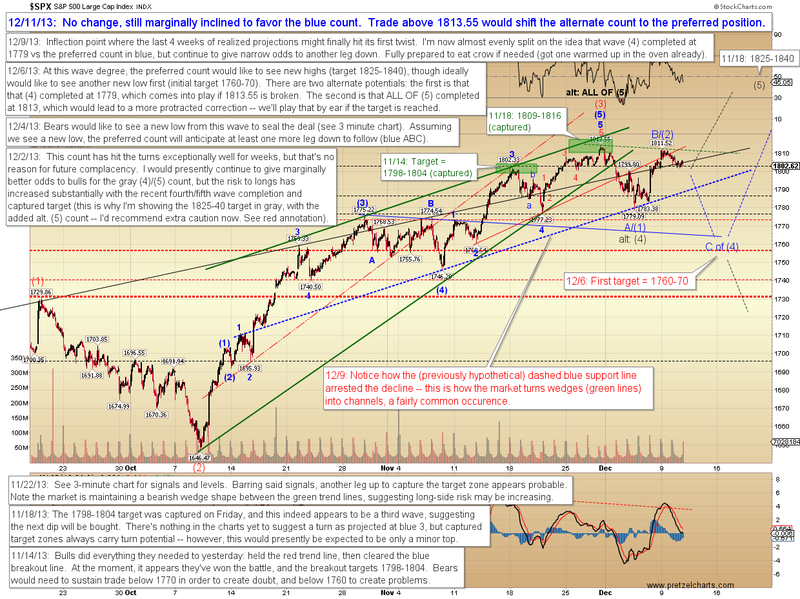 I too was hoping for the SP500 to take a trip to the 1840-1850 zone. But maybe Santa is too busy or just thinks that the market has had a good year already. Also looks like the US budget nerves are causing some hesitation in the markets (again). Pretzel, awesome job on the downside call. You have been killing it lately. Great job. If the preferred LT count is right (as I've been noting) it will be new lows, THEN new highs. Nice work as usual Pretzel. I hope you keep knocking it out of the park.